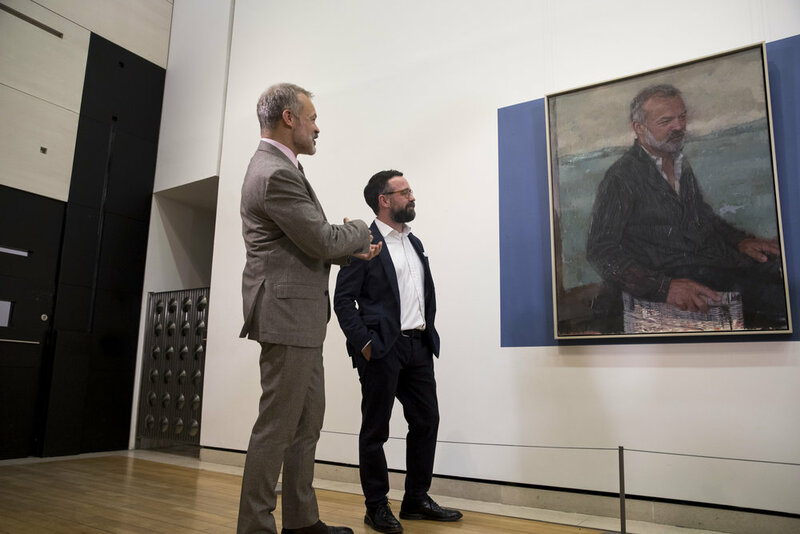 Graham Norton with 2017 Sky Arts Portrait Artist of the Year winner Gareth Reid. Over the course of our campaign, we discovered the two men were actually distant relatives! We've worked with Storyvault Films since 2010 and first worked with the team to launch Storyvault.com with comedian and historian Al Murray alongside Professor Tanya Byron. This unique video library was created by Storyvault Films partner Stuart Prebble in order for individuals to preserve their remarkable memories of friends and families for future generations. Since then, the Eye PR team has been running campaigns with its Film business and in particular on its successful series for Sky Arts, Portrait Artist of the Year and Landscape Artist of the Year. With this client our strategy has always been to put the competing artists centre-stage: our team works closely with each one and their families, developing unique story angles about their journey to the competition, and how taking part has helped transform their lives and careers for the better. We also work with the series' presenters Dame Joan Bakewell and Frank Skinner (and Frank's replacement for 2018, Stephen Mangan) to create interview opportunities across national print and broadcast media; regionally, we’ve tailored our angles, whether that’s about the location, the artist or the sitter to maximise the breadth and depth of coverage for both Artist series. This approach has worked: For the 2017 Portrait Series we secured 2.5 hours of prime TV broadcast time and 5.25 hours of radio across over 30 national and local stations; as well as more than 30 pieces of national and regional/local press coverage. And we’re now working on the 2019 Portrait Series which is on-air February and March. For the 2016 Landscape Artist of the Year, we secured 3.25 hours of TV coverage, and 42 radio stations featured items about the series (a total of seven hours of broadcasting). Six nationals wrote about the series; and there were 47 pieces of regional coverage. In 2018 we secured hundreds of pieces of regional coverage making the artists the stars and helping them support their own businesses. We’re filming in Summer 2019 for the next one .. watch this space! We are currently working with the Storyvault team on the film and theatrical release of soul music legend Teddy Pendergrass as well as supporting its TV debut in March 2019 on Sky Arts. Eye PR has been working with Solgar UK on campaigns such as Your Body Is Designed to Move since 2015. Eye PR has been managing consumer brand relations across the Solgar range for the past three years. Our approach has always been to: put the brand into the context of consumers' lifestyles and habits, demonstrating how individual products and lines fit in with their needs and aspirations; and leverage the trust that the public puts in health and fitness professionals, from journalists and experts through to doctors and trainers. Among the highlights of our relationship with the respected supplements brand have been: the launch of Collagen Hyaluronic Acid Complex and the Beauty range; establishing Solgar 7 as a leading promoter of joint and bone health; the launch of Triple Strength Omega-3; introducing new lifestyle experts – including Dr Ellie Cannon (medical), Zoe Palmer-Wright (nutrition) Laura Williams and BROGA creator Matt Miller (both fitness) – to support core messages and influencers. Dr Ellie Cannon was secured as Solgar’s Brand Ambassador under Eye PR’s direction. We also developed a strategic relationship with the Guild Of Health Writers; and the launch of the Nature's Bounty sister brand in October 2017. Our strategy of courting experts and journalists paid dividends for the Solgar client team: the Solgar brand has been regularly featured and endorsed by key influencers including 600+ print and web publications, with a combined circulation of 30.7 million helping us build the brand’s reputation throughout 2018. A team of 'guerilla Ginos' dance through the city at the first Gloucester Quays Food Festival. Eye PR worked with the Peel Group for almost five years to help put its Gloucester Quays retail outlet on the map. The client tasked us to help develop a number of events to encourage people to visit the area outside a 10-15 mile radius. We collaborated with the Peel Group marketing team to support and develop a number of ‘destination’ events that would appeal to a broad family audience; while visiting these events, the aim was to entice them into the retail outlet with offers and promotions. We managed the first ever Gloucester Quays Food Festival, and its success enabled us to develop the event as an annual event and a must visit for ‘foodies’. We then helped develop the Gloucester Quays Garden Festival and a Gloucester Quays Victorian Market using similar strategies, developing the PR and marketing planning to ensure they had a following and a place on the calendar - not just for those living within a 10 mile radius, but further afield. For the Food Festival, we worked with celebrity chefs James Martin, Gino D’Acampo, and collaborated with Tom and Henry Herbert (the ‘Fabulous Baker Brothers’) and baker Stacie Stewart. For the Garden Festival we secured gardeners David Domoney and worked alongside Diarmuid Gavin, Charlie Dimmock and Carol Klein of BBC Gardener's World. Working closely with partnering Talent, we created VIP packages, and photocalls to maximise exposure in diary pages and style sections of the national and regional press including placements in highly competitive Listings and What’s on sections. The annual events continue to attract hundreds of thousands of visitors each year, and remain at the heart of the strategy for the Gloucester Quays development. Not long before Eye PR was appointed, LA fitness secured a £30 million investment programme for its 81 clubs across the UK, including refurbishing all its gyms. We were tasked with managing the brand and corporate profile at a national, regional and local level. We were asked to come up with a creative idea that would help create buzz in October in London (where 20% of its clubs are based) and to ‘warm up’ the media in the run up to its most important trading month - January. it’s little known that all LA fitness clubs had a swimming pool – and whether gym users use them or not, a pool is a reason why consumers choose one club over another. As part of our creative theme we commissioned 3D artists Max Hill and Joe Lowry to draw a swimming pool canvas that we could take on a road show to key clubs in London, and engaged the British Synchronised Swimming Team to perform one of their warm up routines for the Olympics. Taking over Marylebone train station, London Wall and West India Quay side to support three of LA fitness' newly refurbed Clubs , Eye PR set up photocalls and promotional material to help deliver the buzz . Materials and visuals were shared in-store and across all LA fitness' social media platforms. Positive media coverage at a national and regional/local level – including their tier one media targets The Times and London Evening Standard – resulted in a 120% increase in enquiries in a traditionally quiet month for fitness clubs and led to an average of 40 new business contacts per club. We worked with the team for over 8 years and helped support them as they sold their estate to Virgin Leisure, David Lloyd and Fitness First. Village Gyms: Eye PR was asked to help direct and manage Village Hotels & Gyms brand ambassador, Olympic gymnast Louis Smith who was visiting key clubs as part of a refurbishment and rebrand programme. The team helped manage media and consumer outreach in the relevant local areas including ‘diary page’ VIP meet and greets, alongside all media relations to promote the new sites, encouraging new sign ups. Old Spice: Capitalising on TV hits from the 80s such as Ashes to Ashes, and the British public’s obsession with retro brands, the team helped put Old Spice back on the map .. and into Dad’s bathrooms up and down the country! In our first summer, we branded up two Capris to tour the country sampling the brand in its very own Summer Road Trip, followed swiftly with a tour and photocalls with our beautifully sculptured white horse … mirroring the very tongue-in-cheek advertising campaign! The Hunger Project - World Hunger Day: World Hunger Day is an initiative by The Hunger Project. Started in 2011, it aims to celebrate sustainable solutions to hunger and poverty. More than 815 million people in the world do not have enough food and in 2012, Eye PR worked closely with the charity to support and promote a concert hosted by the wonderful Dionne Warwick featuring special guests and friends including Mica Paris to arise money and awareness of the charity. The Mayors Fund for London: Eye PR has worked with social mobility charity The Mayor’s Fund for London since 2011, which aims to empower young Londoners from disadvantaged backgrounds to acquire the skills and opportunities they need to secure employment, climb the career ladder and escape the threat of poverty. The Mayor is their patron. We developed, launched and devised their own Youth Board which is now a key project for the charity. Support includes fund-raising and awareness building events -from London’s Biggest Breakfast to Kitchen Social. We promoted a unique fundraising exhibition ‘Team GB’s Glory Moments’ featuring signed photographs of every athletes winning moment and helped secure riders and celebrity supporters for ‘Team Boris’ to raise money at Ride London. Alongside its ‘Get Reading’ campaign we also worked with Johnny Ball using a game to make Maths fun. Measure Bowel Health Test: Eye PR launched the first ever digital bowel health test onto the UK market some 4 years ago and helped it sell out within days. The team - a spin out from Oxford University - have since come back to us to help relaunch the brand, and build a sustained pr, marketing and advertising campaign to ensure the right connections with experts to recommend this diagnostic tool to patients as well as direct to individuals, friends and family members.